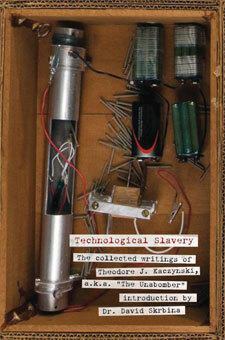 The Collected Writings of Theodore J. Kaczynski, a.k.a. "The Unabomber"
Theodore Kaczynski saw violent collapse as the only way to bring down the techno-industrial system, and in more than a decade of mail bomb terror he killed three people and injured 23 others. One does not need to support the actions that landed Kaczynski in supermax prison to see the value of his essays disabusing the notion of heroic technology while revealing the manner in which it is destroying the planet. Dr. David Skrbina, who teaches philosophy at the University of Michigan, Dearborn, provides fascinating excerpts from his correspondence with the man he calls “a revolutionary for our times.” Theodore J. Kaczynski does not receive remuneration for this book. “Like many of my colleagues, I felt that I could easily have been the Unabomber’s next target. He is clearly a Luddite, but simply saying that does not dismiss his argument. … As difficult as it is for me to acknowledge, I saw some merit in the reasons in [Kaczynski’s writing].” — Bill Joy, founder of Sun Microsystems in “Why the Future Doesn’t Need Us,” Wired magazine.